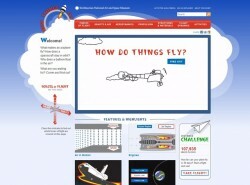 The How Things Fly website is a companion to the physical exhibition at the National Air and Space Museum about the basic principles of flight. Targeted primarily to middle school students, but fun for all ages, visitors to this interactive online exhibition can see the forces of flight in action and explore the flight environment, aerodynamics, propulsion, structures and materials, and flight dynamics. 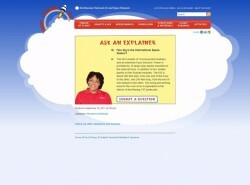 The site combines animations, videos, and immersive educational and social activities in a way that makes learning about complex aeronautical concepts fun and engaging. The "Ask an Explainer" feature invites students to submit their burning questions about flight, which our museum Explainers - high school students who work in the "How Things Fly" gallery - then research with staff experts and answer. 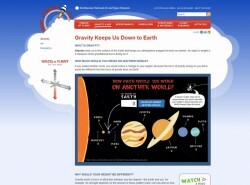 (http://howthingsfly.si.edu/ask-an-explainer). Visitors can also build their own Virtual Paper Airplane, print it out along with directions on how to fly it, and take it on a Virtual Distance Challenge with the help of their friends via email, Twitter or Facebook (http://howthingsfly.si.edu/activities). This website was a unique opportunity for the Museum to take a primarily hands-on, interactive exhibition and create the same learning and engagement in an online experience. There are many websites that address the four forces of flight, most do so at a highly technical and typically college level. 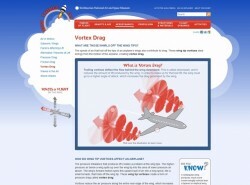 We hope this site fills a previously open niche for making these principles easier to visualize and understand, more accessible to a general audience, and that they make learning about how things fly fun. Image above: The design of the How Things Fly website is meant to be inviting, with a fun movie demonstrating the four forces of flight upfront to frame the entire online experience. The design is geared toward a younger audience yet still interesting and engaging for all ages. Image above: How much do you weigh on another planet? Enter your weight and find out. This is just one example of how we engage students in learning about gravity. Image above: Words and images alone can be a drag, especially when learning about complex concepts. This animation illustrating the action of wing tip vortices is a much more effective way to explain the concept of vortex drag (and it's really cool). Image above: The opportunity for online visitors to ask questions mirrors the constant access to Explainers on the floor during an on-site Museum experience.